I have been following Crystal Paine since ‘way back when’ she was writing her “mommy blog.” I followed her to Money Saving Mom and have been hooked ever since. I love her authentic, honest voice, and her practical tips for living a frugal, intentional life. 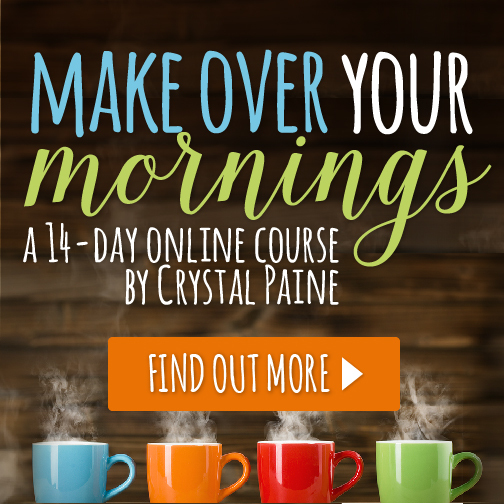 Couple that with my desire to wake up earlier and overhaul my morning routine, there was no way I was NOT going to get my hands on Crystal’s new program, Make Over Your Mornings. And truly, it was one of the best investments in a product I have ever made. I’ve gone through the program once and I am going through the program again so that I can solidify my new routine and develop stronger, longer-lasting habits. 1. It is not a “one size fits all” Program. Crystal doesn’t tell you what you have to do, and/or when you have to do it. You certainly do not have to get up at 5am (unless you want to!) in order to follow this program. What she does is give you concepts, ideas, and suggestions that you can tailor to your own needs and state in life. Crystal is all about helping her readers/customers to live with intention, and that is what this program does. It offers guidelines and a pathway to living the life you want to live for yourself. 2. It is not about perfection. No one is perfect and no, including Crystal, follows her routine perfectly all the time. The program is about developing habits that will carry you, support you, and set you up for success in living a life of intention and purpose. But if it takes you 10, 100, or 1,000 starts and stops before getting it “right,” that’s okay! 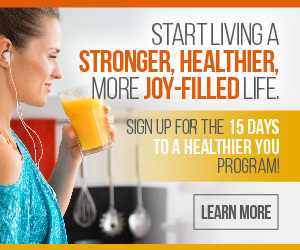 Once you purchase the program, you have permanent access to the program for as long as it exists. Thus, if you want to re-do the program over and over again, you can. If you want to concentrate on one particular day for a week or month, or even a year, you can do that too. 3. You do not have to do it alone. One of the most important concepts of the program is getting an accountability partner. To help with that, Crystal provides a lot of extra support. Purchasers of the program gain access to a private Facebook group, a public Facebook group, and a weekly newsletter. Having gone through the program already, I can attest that the people in the private FB group are very supportive and non-judgemental. Several people have even used the group to find their own accountability partners. Seriously. The Make Over Your Mornings promotional materials state that you can “transform your mornings – in 15 minutes a day!” and it is spot on. It literally took me 15 minutes a day – and sometimes less – to listen to each video, read the work book, and do the daily assignments. And, although I still have a long way to go, these 15 minutes a had have already helped me make great strides in improving my mornings, and my whole day. By the end of the 14 days I felt less stress, have been more intentional and productive during my days, and have become more laser focused on those things that are most important to me. Anyhow, it probably goes without saying, but I give Make Over Your Mornings five (5) stars, and highly recommend it to anyone wanting to stop running around in circles and start living with intention and purpose. P.S. This review was not solicited in any way. I wrote this review on my own, and all thoughts expressed are my own. This is not a paid review, but the post does contain affiliate links. This means that for each purchase made through these links (at NO extra cost to you) I get a small cut of the proceeds. Please see my disclosure policy for more details. I have been trying to get a handle on my daily routine for years with no lasting consistency … Until now! I can’t believe it’s me who’s saying this, but I’m finally on my way to becoming a morning person, something I’ve always wanted! The other day I needed to drop off a fan for a friend before 9am. A few weeks ago this would’ve been UNthinkable! But because my evening and morning routines are in place, I was easily back home from my delivery at 7:30am! I’ve never run an errand that early before! Crystal’s easy to use 14 day makeover has been an answer to a lifetime of prayers for me.